When it’s time to sell or exchange your Iraqi Dinar, you’ll want to be sure of receiving the best exchange rate for it. The better informed you are when you sell your Dinar, the more successful you’ll be in the process. Let’s take a look at the best ways to sell or exchange IQD. This is especially important if you've purchased several different batches of banknotes, perhaps even from different dealers. Most collectors keep Dinars sorted according to the denomination of the banknotes. These are generally IQD 25,000 and 10,000 which are used as the most common denominations for commerce, followed by IQD 5,000 and a variety of smaller dinar denominations. Banknotes are used for almost all purchases in Iraq. Although the Central Bank of Iraq (CBI) has minted Dinar coins periodically, they're rarely used in commerce nowadays. For most transactions, both local Iraqi merchants and international buyers prefer the IQD 25,000 and the other large-denomination banknotes instead of coins or low-value notes. The physical condition of your banknotes is important, and sometimes it's not. To exchange Iraqi Dinar confidently, you should first examine your banknotes to determine whether they're uncirculated or circulated. To learn how notes are graded see this site. Uncirculated banknotes are those which have never been used in commerce – They're crisp, clean and unwrinkled. Often, they're still wrapped in plastic as delivered by the bank to the currency dealer. Although some currency dealers have marketed uncirculated notes as superior to uncirculated, the reality is that both kinds are accepted at the same face value in commerce and are therefore redeemable in Iraqi banks at the same Iraqi Dinar exchange rate. Since the downfall of Saddam Hussein in 2003, the Iraqi Dinar exchange rate has been of great interest to observers who are watching Iraq's economy, particularly because of Iraq's booming oil industry. The Dinar exchange rate, just like the foreign exchange rates for any other currency, depends on the nation's economy and its assets. The stronger the economy grows, ultimately the stronger the currency should become. Nowadays, more people are noticing the success story on the ground in Iraq – The economy is growing very rapidly and is backed by the world's fourth-largest oil reserves. The oil industry is thriving in spite of occasional flare-ups of political conflict. Iraq's future seems to be recovering, and international companies are continuing to flock into the country seeking lucrative development opportunities. During the twelve years since Saddam's departure, hundreds of foreign companies have begun doing business on the ground in Iraq. Most of these companies are very well-capitalized and they have long-term plans to be in Iraq. They're not afraid of scary headlines in the newspapers because they're fully committed to a development horizon lasting decades. Still, individual Dinar owners occasionally change their goals. Many people decide to redeem their Dinar in an immediate exchange instead of waiting any longer. If you need money for unexpected medical expenses, travel or other circumstances that arise at times, then you should consider selling your Dinar. The Iraqi Dinar exchange rate that you receive will depend on the dealer you sell to. When you work with a leading currency dealer like Currency Liquidator, you'll receive a guaranteed best-price offer when you're ready to sell Dinar. What's your Dinar worth? When you're ready to sell Dinar you should check pricing at a leading currency dealer. You'll discover that an exceptional dealer offers full guarantees for both buying and selling Dinar. A licensed and bonded dealer like Currency Liquidator provides authenticity guarantees as well as the foreign-currency industry's premier guaranteed buy-back program. This means you'll have no trouble selling Dinar banknotes whenever you want to exchange them. The guaranteed buy-back program ensures that you'll have a strong, reliable buyer that will pay top dollar when you decide to sell. When you sell Dinar to a leading currency dealer, you can be confident about receiving the best Iraqi Dinar value. And, you'll receive your payment quickly and easily. The Internet is awash with wannabe currency dealers who are several intermediaries away from any direct Dinar sources. They're unable to offer competitive pricing because in most cases they're simply buying currency from a bigger dealer for resale. Instead of dealing with a newbie, when you're ready to sell Dinar or any other kind of foreign currency, it's best to talk with a top dealer who can offer the best price and provide excellent customer service. You should only do business with a long-time, well-established dealer that is a leader in the Dinar community, such as Currency Liquidator. One advantage of working with a leading dealer is having the confidence and peace of mind to ship your currency package to that dealer sight-unseen. With all the recent closings of currency dealers this is more important than ever. 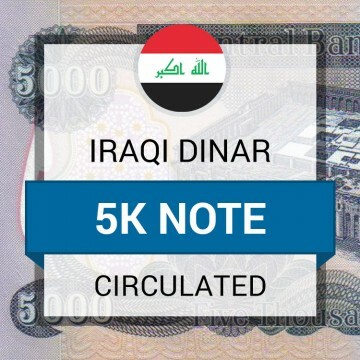 After receiving and reviewing your banknotes, the dealer will promptly pay you the appropriate Iraqi Dinar exchange rate. You can be certain you'll receive the full Iraqi Dinar value to which you're entitled. Should I sell my Iraqi Dinar? The Iraqi Dinar value fluctuates over time, the same way that all currency values move in cycles. Keep in mind that when you sell any currency you'll need to account for the difference between buying and selling prices. In order for dealers to earn enough margin to operate their businesses, there's always a difference between “buy” and “sell” prices. The difference between these “buy” and “sell” prices allows currency dealers to stay in business. It's like buying any other product: When you buy a product off the shelf in a store, the price you pay (retail) is always higher than the price that same merchant would offer to pay you (wholesale) if you were to sell merchandise in bulk to him. In any event, decide how much you're willing to accept for your Dinar after doing the appropriate homework. Is it time to revalue my Dinar position? Most folks periodically take some time to stop and revalue the possessions they’ve accumulated. In many cases, this assessment and reevaluation of what they own leads them to sell Dinar or other possessions. If you need cash, selling your Dinar may be the best way to quickly meet those needs. When you're selling, the most important factor for success is finding a well-established dealer that can offer you the best price. Best of all, only the top currency dealer offers a guaranteed buy-back program that pays you a fair market price, regardless of where you bought your Dinar. To Learn More about the Iraqi Dinar visit the Iraqi DInar blog. Is there a minimum amount of currency I can sell to you? We require a minimum sell order of $250 USD worth of foreign currency in order to process your exchange. Is there a maximum amount of currency I can sell to you? No, we will exchange any amount of currency you wish to sell. Do you buy coins or just banknotes? No, we do not purchase coins. We will exchange banknotes only. How long will it take for you to process my exchange and ship my check? Once your order is received by our office it will be counted and authenticated. From there our accounting department will issue you a business check within 3 business days. Your check will be mailed standard USPS ground mail which can take 3-5 business days. If your exchange is over $10,000 a wire transfer will be sent within 3 business days of receipt of your exchange. Why do I need to go through customer verification in order to sell you my currency? The US Treasury and State Licensing bodies require us to comply with what’s known as KYC (Know Your Customer) this program was created to combat terrorism and money laundering. Unfortunately, if your exchange is over $1,000 there is no way around this requirement. All of the information collected is for compliance purposes only. Will you buy my currency if its ripped or damaged? No, we will not exchange bank notes that are severely damaged, ripped, torn, tarnished or stained. If the notes are not in a condition that we can resell them, then we will not exchange them. How should I ship my currency to you? Upon placing your order we will provide you with detailed step-by-step instructions on sending your currency to us for exchange. How do I know what you will pay me? Once your notes are received, counted and verified we will send you an email with our buy price. If agreed we will process your exchange, if not then we will ship your currency back to you. The price of which we are willing to pay will always be shown on the website before you send us your currency. If you decide you want us to ship your currency back to you there will be a $20 shipping and handling charged to do so.